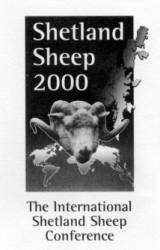 During the last week in september the first Shetland Sheep Conference ever took Place in Lerwick, Shetland. ”The Shetland Sheep 2000” has been an absolute succes, in the conference hall, as well as outside, where the delegates saw the Shetland Sheep play the lead with the Islands as a beautiful background. Sheep-Isle was there, by the way the only delegate from Scandinavia! In the december edition of ” Norsk Sau & Geit” there will be a general feature on the Shetland Sheep, as well as a summary of the conference it self. Moreover Sheep-Isle will, as soon as matters of copyrights etc. has been cleared publish on this web-site, presentations of special interest for Scandinavian sheepfarmers with special regard to scrapie, wool-quality, etc.